The current iteration of the Income Tax code strongly emphasizes defined contribution plans for retirement saving. Therefore, millions of Americans contribute billions of dollars to these accounts every year. As a natural consequence, these accounts have morphed, in some instances, into the largest financial asset (excluding a residential home) for a great many people. Unfortunately, the Income Tax Rules currently permit investors to borrow from these retirements accounts...the Thrift Savings Plan (TSP) is one such type of account. 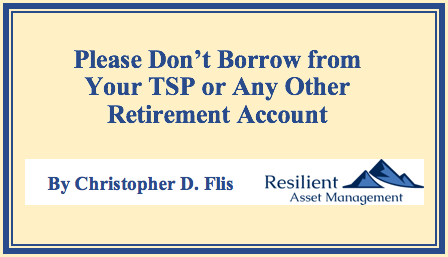 For many reasons, borrowing from your TSP account is usually inadvisable. When borrowing from your TSP Account, your account will be liquidated for the loan amount and the funds disbursed to you. More simply, you will be reducing your invested assets on a dollar-for-dollar basis equal to the size of your loan. There is a misconception amongst some that your TSP Account is collateral as in a securitized loan - this is decidedly NOT the case...you are borrowing your own money. Depending on the type of loan - either for General Purpose Use or for the Original Purchase of a home - your repayment period is from 1 to 15 years at the prevailing 'G Fund' interest rate, which is fixed at loan origination for the life of your loan. The minimum loan is $1,000 with a maximum loan amount of 50% of your account balance or $50,000, whichever is less. It is important to note that payments - $346 every month in the example above - are mandatory. If payments fall into arrears, only one calendar quarter is permitted to catch-up. After the grace period, the loan is deemed a distribution, which is potentially subject to both income tax, penalty, and the permanent inability to replace the loaned funds taken from your TSP Account. If you leave military service, via retirement or otherwise, you will have 90 days to settle your outstanding TSP Loan...it is not transferable to a new employer's plan. If the loan is not repaid at the end of the 90-day period, the TSP Loan is deemed a distribution and potentially subject to early withdrawal penalties and income tax. 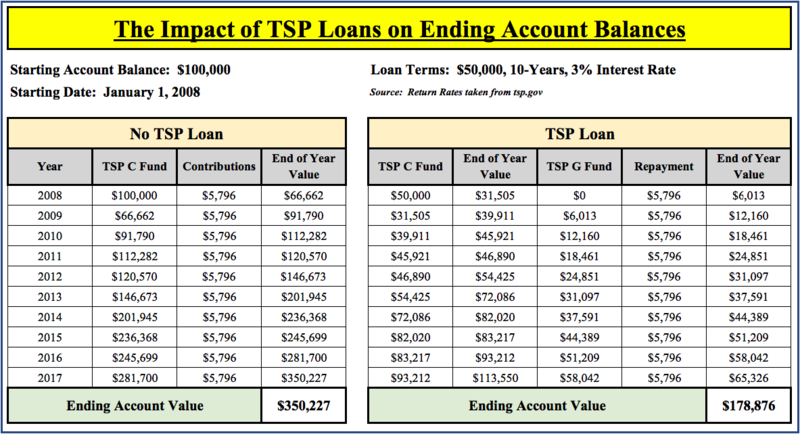 For a more thorough explanation of the TSP Loan Rules, look here. Since the TSP is a retirement savings vehicle, the time horizon for most TSP Investors is counted in decades. Because of this long runway, allocations for most should tilt towards the equity offerings in the TSP - the C, S, & I Funds. As you can see, the ending account value in the non-TSP Loan situation is about half of the fully-invested C Fund. True, the Investor could re-allocate funds within the TSP allocations as the TSP Loan is repaid. However, the overarching impact is felt by halving the initial pot of money out of, in this case, the TSP C Fund. Additionally, this illustration starts with the dreaded 2008 investment year...had I chosen 2009 to start, the results would be even more superior for the C Fund Investor. While every case is unique, TSP Investors typically access their TSP Funds due to a lack of available funds in other accounts. This fund shortfall probably indicates the same Investor has an inadequate (or non-existent) Emergency Fund, might perhaps have credit card debt, and likely does not have an executable budget where spending is less than income. Moreover, the budget is likely to be further impacted by a larger house payment (as opposed to usually lower rental costs). If you are considering a TSP Loan, you should factor in how the payments will impact your Gross Pay and then adjust the calculations, if necessary, to reflect the new Gross Pay, which will lower the purchase price of your home. Oh by the way, don't forget closing costs on your loan too, and don't forget to make an allowance in your monthly budget for home repairs as you are now responsible for fixing whatever breaks, landscaping, and reno projects! With the Tax Cuts and Jobs Act of 2017 (TCJA for short) the standard income tax deduction was raised for Single, Head of Household, and Married Filers to $12,000, $18,000, and $24,000 respectively. These are significant increases from 2017. These increases are so dramatic that the vast majority of filers will now claim the standard deduction instead of itemizing. This fact vitiates two of the primary benefits of home ownership - the Mortgage Interest and Property Tax Deductions. Admittedly, for some, itemizing will still win, though this group is now the minority. Remember, Income Taxes are one consideration for home purchases - not the only one. Active Duty military members move a lot, period. While there are some who homestead for many years, the vast majority are on the move every 3 years. Moving, by itself, is one of the more stressful endeavors one can undertake. Coupling moving with selling a house - or finding a suitable renter - only exacerbates an already tenuous situation. Moreover, if one chooses to buy and sell a home in just one short 3 or 4 year tour, it is easy to illustrate a scenario where the all in administrative costs of buying and selling make purchasing a home a poor decision. 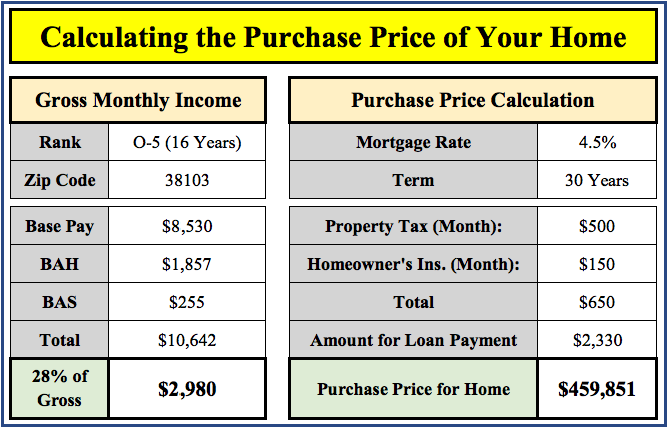 In the example above, a $460K home may appreciate 2% per year over 4 years - New Value: $497K. Decreasing this amount by the 6% sales commission yields an ending value of $468K...not quite a financial bonanza. Conversely, with renting (and a Military Clause allowing you to break your lease), you merely have to hand the keys back to the owner and move along to your new duty station. All the while, your TSP Account balance is likely marching ever higher. As of 2013, the Median (50% above, 50% below) amount saved for those with retirement savings was $60,000. (Source: EPI Analysis of Consumer Finance Data, 2013). By any objective standard, this amount in woefully inadequate for a retirement of any length, even with a Military Pension. Therefore, it is recommended to save early, often, and a lot, and don't put your hand in the cookie jar to buy something, even a house. If you don't have the funds outside of your retirement account, a home purchase is not for you. Instead, save up for a meaningful down payment, make sure your budget can shoulder the carrying cost of a home, and enjoy the benefits of renting, of which there are many. Simply put, there isn't one. 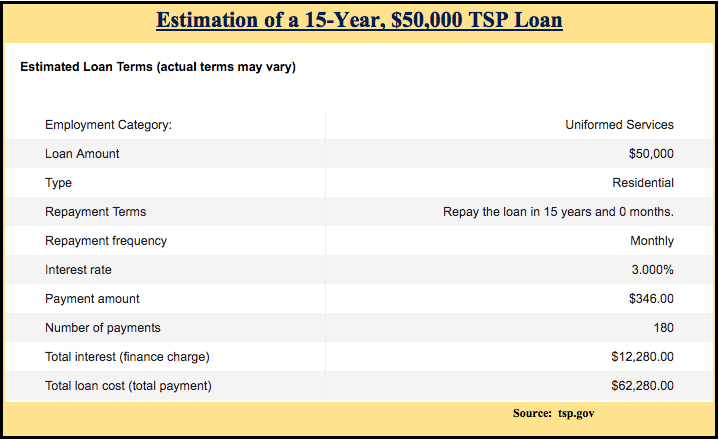 Having had military members come to me with a TSP Loan already in-place, I can honestly say I have not observed a situation where the TSP Loan was desirable...the Opportunity Costs mentioned above were the typical spoiler. Moreover, the individuals who took the loan typically felt some degree of regret after the fact, usually because of a maxed out budget. Conversely, I have also talked a few people out of taking a TSP Loan. These individuals were generally quite happy with their decision to not raid their retirement account.